Over the past few months CounterPath’s Bria softphone clients have become an industry standard softphone client for connections to SIP-based services whether from a hosted service or a local PBX. Bria offers chat, voice calling and, as first demonstrated at CES 2012, video calling between Bria clients or out to the PSTN. It’s available on PC’s (Windows, Mac) as well as iPhone, iPad and Android devices. It can be skinned to meet a client’s user interface needs. Their target market comprises larger enterprises, hosted PBX service providers, SIP-based PBX hardware vendors and carriers looking for customized solutions to migrate into and take advantage of IP-based communications. 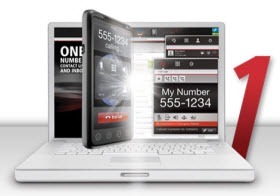 Last week Rogers launched its One Number service as an adjunct to its wireless subscriptions. I wrote about it recently when it was in beta testing. Basically it’s a web portal that mirrors any supported mobile device onto a softphone client (called a web phone by Rogers) within your browser, with a Contacts address book, text messaging capabilities and a “web phone” window for receiving, placing and logging calls. The bottom line is that if you call me on my BlackBerry I can answer on my BlackBerry or on a web phone on my Windows and Mac PC’s. Calls placed from the web phone on my PC appear to come from my BlackBerry (but without the per minute wireless connection charges and with no long distance charges for calls within Canada). Unlimited calling subscriptions are available for calls to the U.S. ($10 per month) and to 26 countries ($20 per month) when calls are placed from the web phone anywhere worldwide with an Internet connection. It supports video calling when both ends of the call are on a PC using the One Number portal and web phone. While Rogers One Number has a browser-based app as the user interface, the infrastructure behind the user interface is CounterPath’s Bria technology. Given that Bria has experience across many platforms can we expect to see, say, a web phone for iPad?, etc. Also, since CounterPath has licensed Skype’s SILK technology, can we expect to have the first implementation of superwideband voice associated with a North American carrier’s services (for calls between PC’s)? More importantly when you look at the list of features above and the fact that carriers have large customer bases, the Bria platform opens paths for the carriers to introduce Bria-based services, similar to the Rogers One Number service, for their customers. It provides one path for carriers to compete with “over-the-top” service such as Skype and GMail by providing a bundle whose value-add is adding in these features. It introduces one way for a carrier to differentiate itself in a very competitive wireless environment. Yet the carrier can customize the user interface and the features to be included. Bottom line: CounterPath is reinforcing its role as a proxy for demonstrating the evolution of IP-based communications services into business and carrier communications environments. Providing carriers with a customized solution that can be implemented on all the common PC and wireless platforms opens up the potential for new IP-based social communications services for carriers, as exemplified by the Rogers One Number service. While at the moment it is certainly a leading-edge differentiator in a competitive market, it also has the potential to become an industry standard as more carriers adopt Bria-type offerings. The final true test will be the level of carrier customer uptake and adoption. One product marketing question that it will address is whether carriers can leverage their large customer bases to outflank free or low cost “over-the-top” services such as Skype or GTalk, where only a broadband Internet service is required with no additional carrier overhead or relationship required. One final question related to Rogers: I also have Rogers Home Phone landline service which is integrated into its cable TV service to pop up notification of phone calls with caller ID information and response alternatives (accept, voice mail, decline). Can I expect to see my wireless calls appear on my TV also? Over the next few weeks I’ll have a chance to use it and Skype to help define where each makes both logistical and economic sense. Update: Check out Dean Bubley’s analysis of the impact of Rogers One Number on the carrier business model considerations: “Semi-OTT” extension services for telcos – less risky than full standalone Telco-OTT.